From joblessness to crime and bank-breaking auto insurance rates, Michigan’s cities suffer the state’s most intractable challenges. The state is home to 138 cities, 36 townships and 15 villages that last year were considered to be financially distressed due in part to underfunded pensions and decreasing revenue sharing payments from the state. Statewide, unfunded pension liabilities for local governments are roughly $7.5 billion, in addition to $10 billion in unfunded healthcare liabilities. On average, local pensions are only 19 percent funded (a crisis that partly led to Detroit’s bankruptcy), Bridge research found. But only two candidates for governor – Democrats Abdul El-Sayed and Gretchen Whitmer – have developed specific agendas and policy prescriptions for cities. The others have plans they say would benefit all of Michigan, including those in urban areas, as well as issues such as auto insurance that are particularly acute there. Today, Bridge Magazine examines urban policies of the candidates: Republicans Lt. Gov. 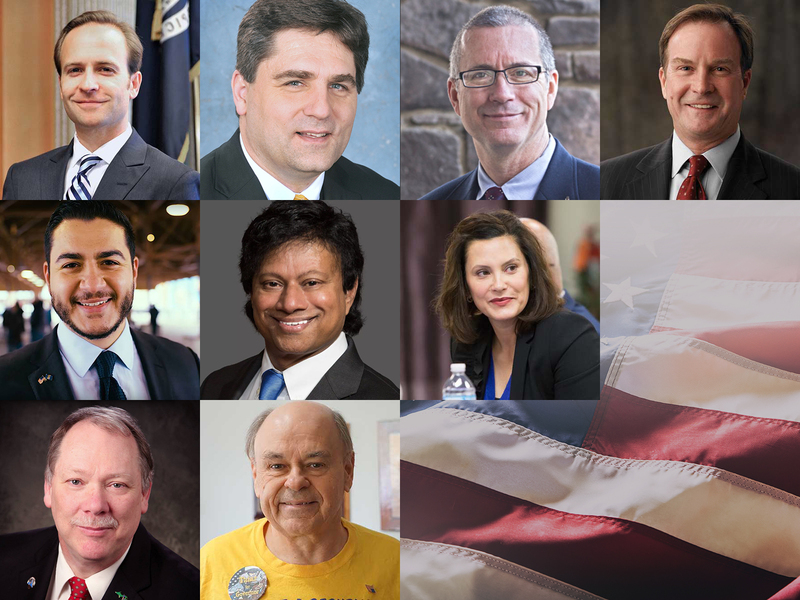 Brian Calley, Attorney General Bill Schuette, State Sen. Patrick Colbeck, and Dr. Jim Hines; Democrats Whitmer, El-Sayed and businessman Shri Thanedar; and Libertarians Bill Gelineau, a title insurance company agent, and John Tatar, who owns a construction company. Improve Michigan's pre-K-12 schools and strengthen vocational and technical training. “World-class educational opportunities are critical to helping urban areas,” his campaign manager wrote in a statement to Bridge. His education plan does not include a funding component. Support a program called Community Ventures, an economic development plan led by the Michigan Economic Development Corporation to match unemployed people in the state’s “most distressed urban areas” with employers as well as workforce readiness training, adult education, and literacy tutoring. Reform Michigan’s no-fault auto insurance system by establishing a state agency to investigate fraud and opening the Michigan Catastrophic Claims Association books to the public. Focus on helping Flint rebound from the water crisis by combatting all sources of lead poisoning and continuing to communicate with experts to mitigate risks from paint, dust and soil. Reduce car insurance costs by more than half by eliminating healthcare-related statutory auto insurance coverage mandates. In essence, that would repeal laws requiring drivers have insurance and make those in accidents to sue for damages. Shift state spending to local units of government by increasing revenue sharing so that local city councils and county commissions can decide how to spend money on needs such as roads and public safety. Phase out the 4.25 percent personal income tax, which raises about $9.8 billion a year. Allow people to pay tax-free money into free-market, direct primary care service to lower overall healthcare costs. The service would cover basic primary care and in some cases basic lab tests and X-rays. It would not cover anything beyond primary care or hospitalization. Take $875 million from the personal income tax for each of two years - a total of $1.75 billion - to improve roads statewide, including cities. Lower auto insurance rates by creating a fraud unit and standardizing fees for health care costs, which could prevent hospitals from charging higher fees for auto-related injuries. Improve reading and math scores by putting reading coaches into the classroom with the help of an alternative teaching certificate for the coaches. The plan includes no specifics about costs. Increase vocational training in schools by allowing skilled trades professionals to teach in schools. Increase reading scores by appointing a literacy director, who would be stationed in the governor’s office and create a Michigan Reading Foundation to raise money privately for more reading coaches and summer reading camps. Provide transportation grants or incentives for children trapped in failing schools so they have additional options. The plan does not include cost specifics. Redirect an unspecified amount of existing state resources toward vocational education and advanced teacher training. Reduce school violence by expanding the state’s OK2SAY school safety program that allows students to submit confidential tips. Slash auto insurance rates by cracking down on fraud, ending frivolous lawsuits with tort reform and giving Michigan residents choices in terms of their insurance coverage. Repeal the emergency manager law. Limit the use of corporate tax capture as an economic development tool; repealing the Transformational Brownfields Plan that gives developers tax breaks. Increase the minimum-wage to $15 per hour from $9.25 per hour. Increase the earned income tax credit from 6 percent to 20 percent, which would give a tax refund for working low-income families. If state revenues increase, the credit would increase to 30 percent. Increase revenue sharing to cities to pre-2001 levels. Strengthen the criminal record expungement process and push for legislation to prohibit private employers from inquiring about criminal records until after a conditional offer of employment. Diversify police forces by mandating a census-based review of force diversity. Cut the school to prison pipeline by improving schools starting with creating universal pre-kindergarten through the state’s intermediate school districts. He has not specified costs or funding. Create a school trust fund with money that could only be used for schools in economically depressed areas to include money for restoring school buildings. Encourage entrepreneurship by bringing business incubators to urban areas. The plan does not include costs. Replace the 4.25 percent income tax and move the state to a graduated income tax system that would require wealthier earners to pay more. Millionaires would pay an income tax of 10 percent and those making $200,000 and $1 million a year would be taxed at 8.85 percent. Households with an income under $50,000 would pay no income tax. Invest $500 million into career and technical education and job training programs – community colleges and intermediate schools districts would serve as conduits for these resources. Increase the minimum wage to $15 an hour from $9.25 per hour. Lower auto insurance rates by ending redlining. Appoint a cabinet-level position to combat poverty. Increase the earned income tax credit from 6 percent to 20 percent. Direct an unspecified amount of public security and placemaking dollars to city programs focused on improving city lighting. Support the increased use of body cameras by police; work to prevent gun violence with universal criminal background checks. The plan makes no mention of costs. Help tenants of foreclosed residential property by implementing a statewide right of first refusal system by helping them buy the home or remain as renters. Add incentives for developers to build affordable housing. Expand the Office of Minority Health to spearhead task forces, partner with community leaders and collaborate with research universities to develop research on health disparities and how best to combat them. Work with cities to replace aging infrastructure such as water pipes. His plan is silent on costs, but mentions repealing regulations that require residents to hook into municipal water systems. That may help avert a situation similar to the Flint Water Crisis. Eliminate the mandate for no-fault insurance. Remove auto insurance from credit reports.